Smallest and cheapest radio. No DTMF keypad. 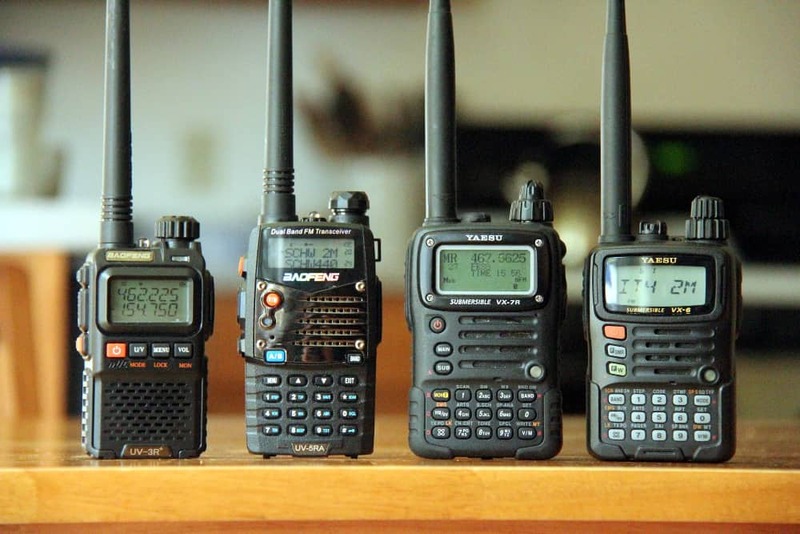 It doesn’t have the transmit power of the others but it is easy to pocket–the best radio is the one you have with you. Part 90 means it can be used for ham and business. Slow scanning. This is the radio of choice for your pocket. Accessories are very cheap. Best bang for the buck, not easy to program without a computer. Part 90 Certified means it can be used for ham and business, it’s a great all-purpose radio and I have a few in my emergency kit. Slow scanning. I think this model is the best value for the dollar. Accessories are very cheap. I found this radio to a little too complex for my tastes, I would constantly have to get out the manual to figure it out where the other three radios are pretty intuitive. It just has too many options I don’t care about. For being so complex, I couldn’t find that it had an advantage over the VX-6R other than dual receive. Magnesium case, submersible. This is the best radio for someone who likes to tinker with all the settings and learn it inside and out. This is my radio of choice and the one I take hiking, it’s easy to program on the field and relatively compact. It can handle just about anything I want it to do including outside the amateur bands (shortwave, AM/FM radio, etc.). Magnesium case, submersible. One neat feature on the Yaesu radios is ARTS, I was curious about the simplex range I’d get so I put one on my desk and the other in my car and drove around town, the radio will tell you when they go in and out of range.